Three New Jersey men have been arrested and charged with running a counterfeit drug storefront on the dark web that sold hundreds of thousands of narcotic pills nationwide in exchange for cryptocurrency, according to Manhattan District Attorney Cyrus Vance’s office. The investigation targeted an operation advertising itself as “Sinmed” on the dark web, or darknet -- an encrypted portion of the internet that is only accessible using anonymity-providing cyber tools like the Tor Browser. Investigators seized nearly a half-million pills, the largest ever seizure of pills in the state of New Jersey, according to Vance’s office. Vance’s office was tipped in 2017 to noticeably large ATM withdrawals in Manhattan and across the river in New Jersey and began tracking a trio of men allegedly involved in the scheme. 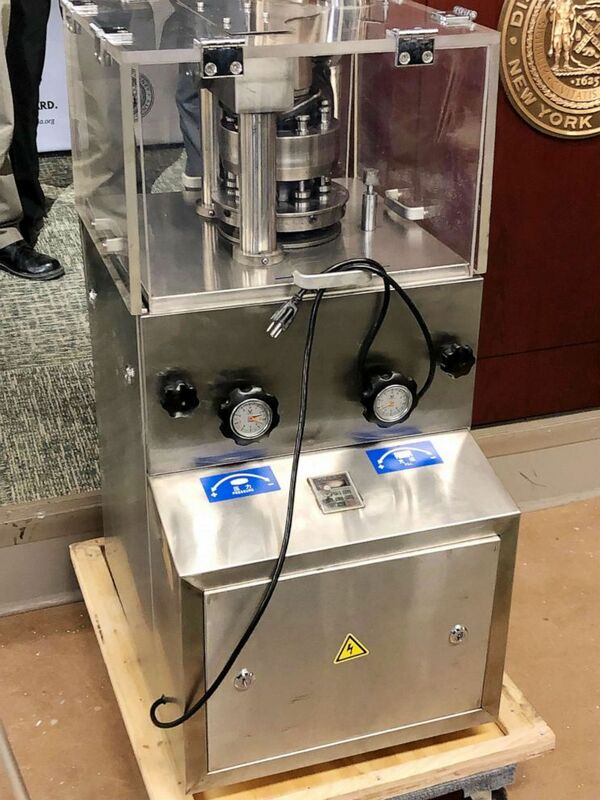 A pill press authorities seized as part of an investigation into counterfeit narcotics sales on the dark web. The alleged drug ring -- which was run in part out of a cell phone repair shop in Asbury Park, New Jersey according to officials -- sold illicit and counterfeit drugs including counterfeit Xanax, ketamine, GHB and steroids, as well as fentanyl-laced heroin and methamphetamine, according to authorities. In addition to the recovered drugs, authorities also seized drug ingredients, pill presses and other drug-manufacturing equipment. If you are engaging in illicit activity on the dark web, you are on notice: we know how to find you, we know how to put you out of business, and we know how to hold you criminally accountable. Undercover investigators for the Manhattan D.A. 's office purchased about 10,000 alprazolam tablets, in addition to ketamine and GHB, from the darknet storefront, according to officials. Additionally, the Manhattan D.A.’s Cybercrime and Identity Theft Bureau "identified more than 1,000 packages that were shipped by the defendants from New Jersey to locations across the country, and seized an additional 8,000 tablets by intercepting several of the packages," officials said in the press release. Nearly all of the packages had return addresses that falsely identified the sender as a Manhattan business, officials said. Chester Anderson, 44, Jarrette Codd, 41, and Ronald McCarty, 51 – all of New Jersey – were arrested on multiple conspiracy and money laundering charges, officials said. Anderson was additionally charged with criminal sale of a controlled substance and identity theft. The trio of suspects laundered more than $2 million in cryptocurrency, officials said. It was not immediately clear whether any of the three defendants had retained attorneys. The Middlesex County Prosecutor’s Office is handling the prosecution of the items seized in New Jersey, officials in Vance's office said.